MyPillow Review - Does the Comfort Match All the Hype? If you’ve ever been late-night channel surfing by the glow of your television, there’s a good chance you’ve seen an infomercial for MyPillow. Founded by Mike Lindell, the MyPillow pillow was engineered to offer sleepers of all styles comfortable, even pressure relief. While MyPillow Inc. does manufacture mattresses, sheets, and other sleep accessories, the pillows earned the highest consumer ratings! When selecting your pillow, there are four different fill levels from which to choose, varying in loft and support. 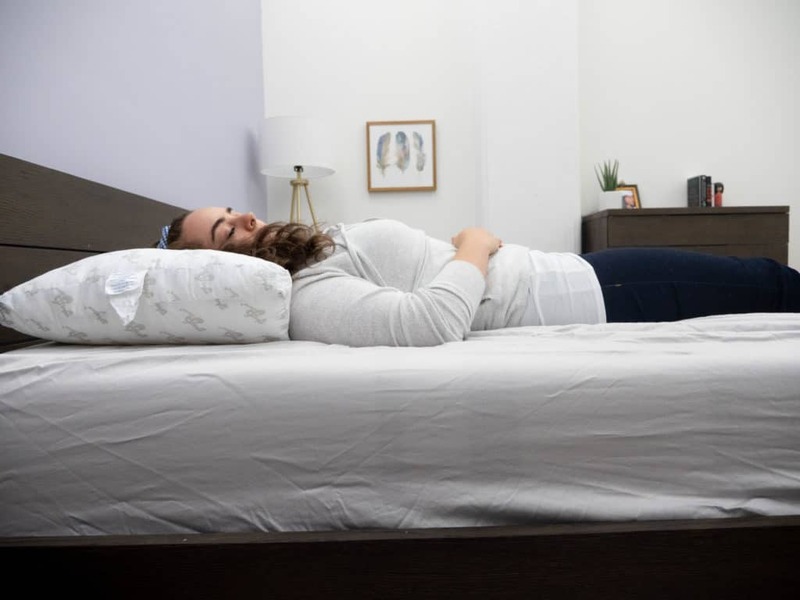 The folks at MyPillow Inc. offer this range of firmness and feel with the intention of accommodating everybody’s sleepy needs, no matter your preferred position. In this review, I’ll be rolling around with all four fill-levels so I can get the full MyPillow experience. As the self-proclaimed “world’s most comfortable pillow,” I have no choice but to put that title to the test! If you don’t have time to read the full review but still want to hear my thoughts, click here to skip to the review summary. MyPillow pillows come in four different firmness levels so sleepers can choose the feel and support that's best for them! All four of the MyPillow fill levels are made from the same materials, though they offer different levels of internal fill according to your preferred level of loft and support. The cover fabric of each pillow is made from 100% cotton, and it feels light and soft to the touch. The pillows’ filling is made from 100% polyurethane foam which makes them shapeable, fluffable, and easy to fold. 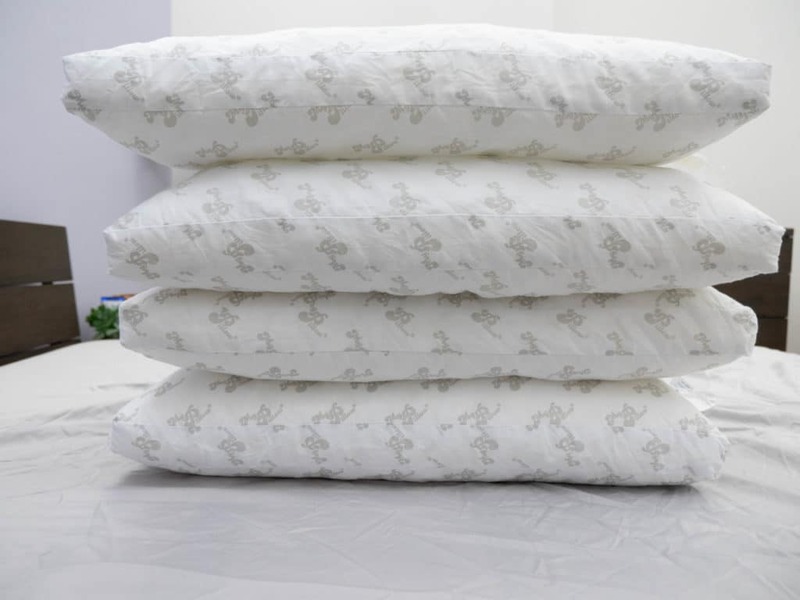 The polyfoam is shredded which is intended to enhance the breathability of the pillow, and make it easier to manipulate under the cover fabric. 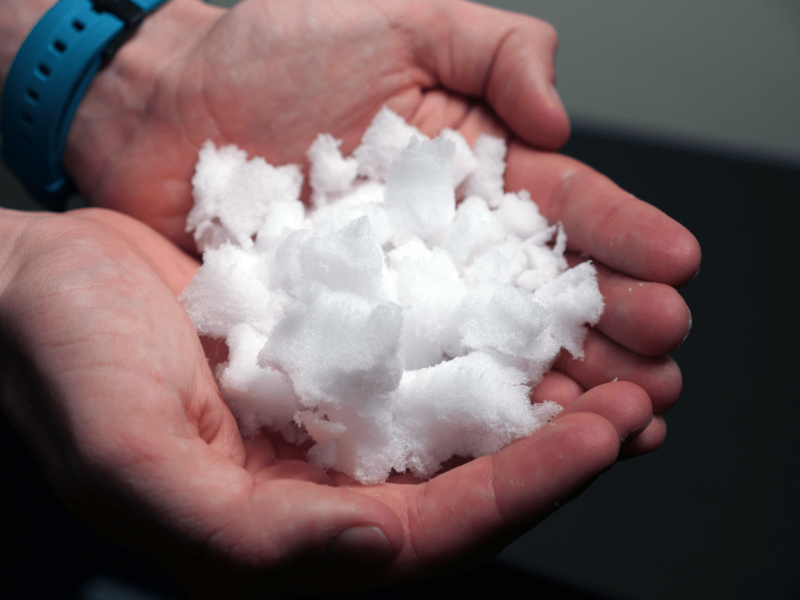 Polyfoam has a fluffy, cushy feel often found in mattress toppers or couch cushions. Now, while they’re not adjustable, the different fill levels do cater to different sleeping positions. They range from soft to medium-firm and when you’re choosing your MyPillow online, the fill levels are categorized by color. From the lowest fill to the highest, the order goes: yellow, white, green, then blue. From yellow to blue, the fill levels slightly increase, adding loft and support. The idea here is that between four different fill levels, sleepers of all styles can find the loft that best suits their slumber habits. Because the pillows do look pretty similar, you can check to see which pillow is which by looking at the lettering on the pillow’s tag. The care instructions will be in the color that corresponds with the fill level. Every MyPillow must be put it in the dryer for 15 minutes before use in order to get it to its full fluff capacity. These fluffy, foldable pillows are designed to offer comfortable support for sleepers of all positions, helping us to get the full night’s rest our bodies need. MyPillow offers sizes in Standard/Queen and King for each of its pillows. The MyPillow Premium and Giza Elegance pillows measure 16.5 ” x 26″ x 2″ for the Standard/Queen and 16.5″ x 32″ x 2″ for the King. Fun Fact: The idea for MyPillow came to founder Mike Lindell in a dream! When he woke, he got started on the logo and prototype right away. WHAT DO THESE PILLOWS FEEL LIKE? So, because each pillow has a different fill level, each one is going to have its own feel and support. The less fill the pillow has, the softer and flatter it’s going to feel. However, because they are made from the same materials, there are definitely some things that all four have in common. The cotton cover fabric of these pillows has a light, soft, breezy quality. It’s not a noisy material at all, and you can press into it and rub against it without any of that crinkly sound. The polyfoam inside each pillow is easy to manipulate and fold, so even though you cannot go in and manually adjust the loft, it’s still fairly easy to shape. When you press into the pillow, the fill offers a quick response to pressure and you can kind of smooth it out to create an even distribution. It’s important to run each pillow through the drying machine before use, as the shreds of polyfoam can actually feel a bit lumpy without the proper level of fluffing. The feel of the yellow and white pillows is quite soft, the green is medium, and the blue is medium-firm. As more fill is added, the shapeability decreases a little bit and the support increases. Stomach sleepers who like a softer, flatter pillow might better suited to the yellow and white pillows, while back and side sleepers might be more compatible with the thicker firmness of the green and blue. While the loft and support does vary, the MyPillow doesn’t provide that sink into the material that you might experience with memory foam. It’s got more of a fluffy, cushiony kind of support. The polyfoam inside each MyPillow is shredded in order to enhance the fluffable, foldable qualities. The folks at MyPillow suggest that, if your pillow ever gets a little flat, you can just throw it in the dryer for 10-15 minutes and its fluffiness will soon be restored. 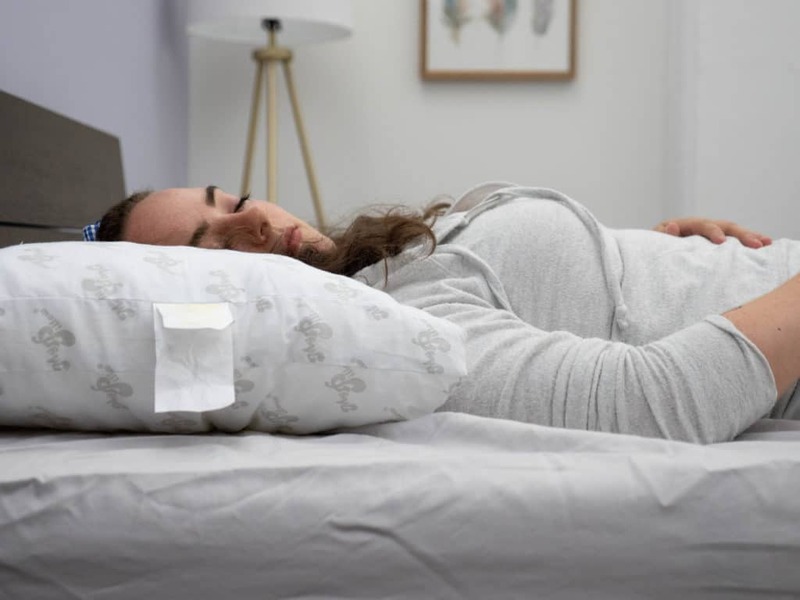 Like many sleepers, I had seen the MyPillow infomercials and read some reviews before I got the chance to test them for myself, so I was pretty excited to see what all the hype is about! As I said, there are four different fill levels from which to choose, so I got one of each to make sure I didn’t miss anything. They arrived tightly compressed inside plastic wrapping, each one bearing a different color font in the tophand corner. This color indicates which fill level is which, but if you eagerly rip the pillow out from the plastic (like I did) before you have a chance to take note of it, the care instructions on each pillow’s tag are typed in the corresponding colors. I have to be honest: as I opened each package, and the MyPillows unfolded into my arms, I was surprised at how thin and flat they all felt. And each one felt exactly the same! I stood there for a minute, confused and cradling four limp pillows when I noticed some bright red lettering and exclamation points on the plastic packaging I had tossed aside. It read: “DRY FOR 15 MINUTES BEFORE USE.” Ah, that explains it. So, I made my way to the laundromat, tossed them all into the dryer for 15 minutes. When they emerged, they felt much fluffier and I could clearly see the difference in fill level. Once the pillows were officially ready to be tested, I had worked up a nap-appetite! I began with the lowest fill level (yellow) in the supine position. Right away, I could see how folks who prefer a flatter, softer pillow might like this for supine sleeping. It’s easily compressed and allows your head to lay flat on the mattress, helping your spine to remain in neutral alignment. Personally, I like a bit more support when I’m on my back. The yellow MyPillow is definitely very soft and the weight of my head sort of smooshed the polyfoam down so much that it felt like there was nothing between me and the mattress. I also noticed that the fill was easily divided within the pillow and, without frequent fluffing, sort of lumped together a bit. But I had a feeling that this foldable, soft pillow might be great for stomach sleeping. So, I moved onto my stomach and as I suspected, this fill level seemed made for this position. The softer, malleable nature of the lower fill level allowed my head to rest comfortably without forcing my neck into an upward angle. 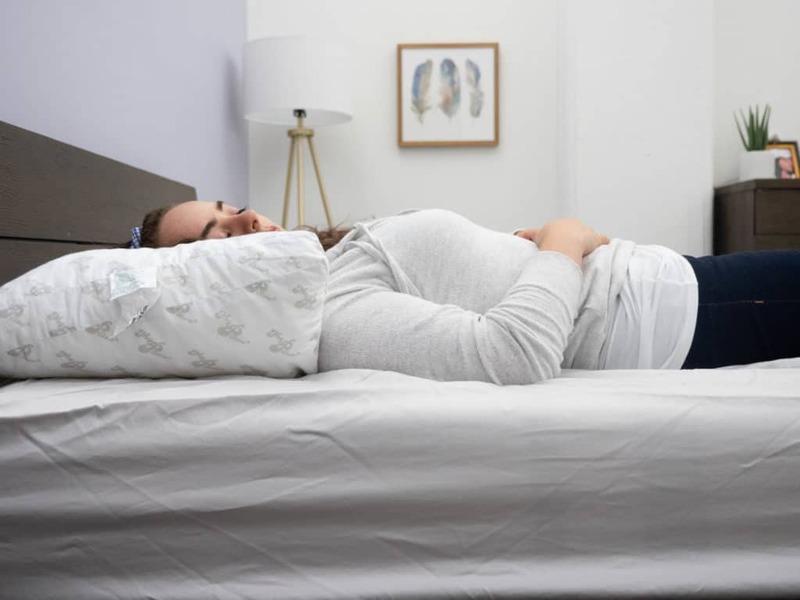 Big, fluffy pillows are great — but when it comes to stomach sleeping, you really want something flatter that’s not going to crane your neck in any way. Sleeping in the prone position with the MyPillow felt very natural and it was easy to spread the internal fill out into an even distribution. Many stomach sleepers like to stretch their arms out and embrace the pillow from underneath, and I found this to be really comfortable with the yellow MyPillow. As I said, the fill is very soft and foldable so you can kind of prop up the areas you want to be loftier, and flatten the spots that you need to be less elevated. Rolling onto my side, it was immediately obvious that this pillow was too soft for lateral sleeping. When I’m sleeping on my side, I need a firmer, loftier pillow to make sure my spine maintains neutral alignment. When this pillow is laid flat on the mattress, it only provides the slightest bit of cushiony support, so my shoulder was sort of bearing the brunt of all my body’s pressure. However, because this pillow is so foldable, I was able to achieve a firmer loft by folding the pillow in half — and that felt pretty comfy! Nevertheless, I definitely got the sense that the soft, yellow pillow was best suited for stomach sleeping. The white fill level is pretty close to the yellow, but with slightly more stuffing. So, I have to say my review of this level is pretty similar to the yellow for each position. The most noticeable difference to me was the extra cushiony support in the supine position. I didn’t love the feel and support of the yellow MyPillow for supine sleeping, but the added fill made the white just loftier enough to provide a nice extra layer of comfort. So, for folks who like a thin yet fluffy pillow for supine sleeping, I think the white fill level is a good choice. It doesn’t conform to your head and neck so much as it allows a fluffy buffer between you and the mattress. I definitely felt like my posture felt very healthy in this position with this pillow. Moving onto my stomach was, again, very seamless. While there is a bit more loft to the white MyPillow, it’s still soft and flat enough so as not to elevate your head at all. I felt like it was easy to sort of hug this pillow under me and bunch up the shredded polyfoam to personalize my desired loft. Like I said, the white and the yellow pillows felt only very slightly different so I would definitely say this is best suited for stomach sleeping as well. Rolling onto my side was not quite so seamless! Much like the yellow fill, the white MyPillow just doesn’t offer the kind of lofty, firmer support that I need in the lateral position. Folding it and sort of bunching the fill together helped me to reach the support I needed, but I don’t think the softer pillows with less fill are well suited to lateral sleeping. No matter the position you’re sleeping in, it’s so important to make sure your head, neck, and spine are all in happy neutral alignment. Even the slightest bit of elevation or lack of support can create unhealthy posture and have you hurting the next day. The green MyPillow is markedly fuller than the yellow and white, and I actually found this one to be comfortable in every sleeping position. Pressing into it, I could feel that the support offered a medium firmness, but still felt fluffy and plush. I began in the supine position and, again, it was very comfy! The extra fill did prop my head up a bit more, but it’s still soft enough that it didn’t feel like my neck was being craned — I just had a bit more cushion to play with. The cushy poly foam sort of puffed up on both sides of my head so that I could comfortably rest my temple to the left or right, and the middle flattened enough so that my posture remained neutral. I did notice, again, that the shredded polyfoam has the potential to divide within the pillow a bit, so I kind of had to fluff it up a few times in order to achieve even pressure relief and get rid of that lumpy feel. I had seen some online reviews complaining about a similar issue with the fill, so I did worry that this might be an ongoing issue. Rolling onto my stomach, I could feel that the pillow wasn’t quite as flattenable, but it was soft enough to keep my neck aligned while still supporting my head. I actually preferred the extra fill for this position as it gave me more cushion to manipulate; it was easy to kind of bunch up the sides to add or subtract loft as needed. The thing about MyPillow’s fill is that it’s so easy to move around within the cover fabric, so you can push the stuffing around however you like! Sleeping in the lateral position was pretty cozy, but I did have to prop myself up a bit in order to achieve healthy posture. When I’m on my side, I like to sleep with an under underneath the pillow anyway, so it wasn’t an inconvenience, but it’s still worth noting that side sleepers might need a little extra support using the green MyPillow. Since it’s so easy to fold, I kind of just folded one of the pillow’s corners to bump up the firmness a bit, and then I was good to go! In my rolling around with these pillows, I did start to notice that the fill seemed to trap a bit of heat. The cotton cover fabric was pretty light and breathable, but the fill itself did seem to warm up a bit if I kept my face in one spot for too long. So, if you’re a hot sleeper, that’s something to keep in mind. So, the blue MyPillow is clearly the fullest and firmest. Pressing into it, you can definitely feel the extra support and there isn’t as much excess cover fabric as the others. Because of this, I found that the fill was less likely to divide or clump within the pillow, though it’s still a good idea to give it some enlivening fluffs once in a while. While it is fuller, I wouldn’t say that it’s got firm support; it feels medium-firm to me. So, it definitely felt best suited to back and side sleeping. Lying in the supine position, I felt very supported and the fill really fluffed up around the sides of my neck, sort of locking it in place. Because of the extra loft, I did have to do a bit of repositioning to make sure my head was not propped up at an awkward angle. Once I shimmied down the pillow a bit, I felt nice, even pressure relief for my head, neck and shoulders. Sleeping in the lateral position was also pretty cozy, but again, I needed a little extra firmness. So, I folded the side of the pillow between my face and my arm and slipped sweetly into my comfort zone. The fill offered a nice balance between plushness and support. As a side sleeper, I love to be able to get my pillow to the perfect firmness and loft so that I can stay in that position all night. The only thing I didn’t love about the blue MyPillow for side sleeping was that, the more I folded or bunched up the fill to increase firmness, the warmer it seemed to get. I tend to sleep very warm and I like a pillow that can kind of counteract that, but the shredded polyfoam did trap some of my body’s heat. I was worried that the loftiest MyPillow option wouldn’t be suitable for stomach sleeping, but because the fill is pretty easy to flatten, it was actually quite comfy! The extra cushion provided a fluffy place to rest my head, but also kept my posture neutral. That being said, I did have to press the fill down a bit and smooth it out so that it wasn’t too firm and lofty. I would still advise stomach sleepers to test this pillow out just to make sure that it doesn’t elevate your head and neck. After testing the full performance of each MyPillow, I kind of had an idea about which I would enjoy for hugging and hip support, but I like to be as thorough as possible in these reviews! So, I tested them all under my arm and between my legs. I found both the yellow and the white pillows to be a bit too thin for these both of these styles of sleep. I love sleeping with an under-the-arm-hugger, but I like it to be as fluffy as possible. And when it comes to between-the-leg support, both the yellow and the white just flatten beneath the weight of my thigh. The yellow and white just didn’t really provide me the support I’m looking for in under-the-arm and between-the-legs pillows. The green and blue MyPillows, on the other hand, were both pretty great for hugging! The shredded foam offered a nice malleability so I could really get a good grip, and pull them in very close to my body which felt very comforting. 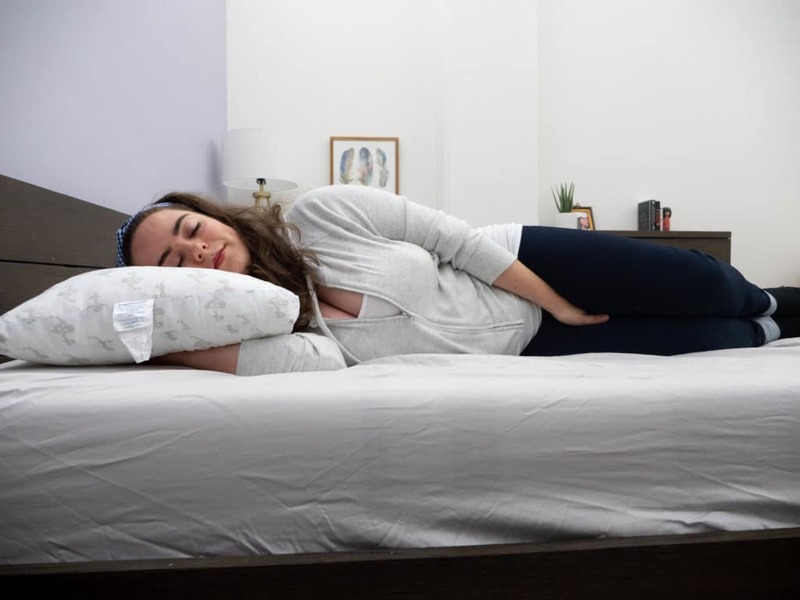 When I’m choosing a pillow for in between my legs, I’m definitely looking for something supportive that’s going to relieve some pressure in my hips and lower back. That said, the only one I found suitable for this style was the blue MyPillow. It really gave me that comforting feeling of wrapping my leg around something, but also didn’t allow the weight of my leg to totally flatten the pillow. I got some nice pressure relief in my lower back, and it helped to prop my hips up into happy alignment. 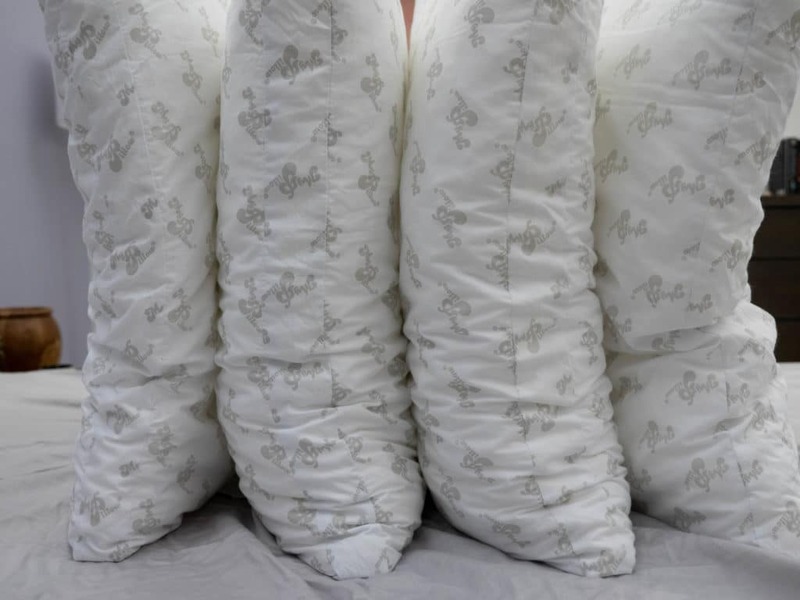 Pillow-stacks — Because none of these pillows are very firm, they are great for stacking! If you need an extra cushion-boost to top your other bed pillows, these pillows could be very useful for that. Likes The Fold — The shapeable nature of shredded polyfoam makes these pillows really easy to fold. So, if you like to smoosh and fold your pillows into the right loft and firmness, these might be right up your alley! Combo Sleeps — The green and blue MyPillow options were very versatile and offered comfortable pressure relief for every sleeping position. The yellow and white options were ideal for stomach sleeping, so if you get all four, you’ll pretty much have your bases covered! While there are all kinds of fun things to enjoy about MyPillow, there are some things that sleepers might consider to be drawbacks. Not Sleep-Ready — Every MyPillow must be run through a drying cycle for 15 minutes before use or they will feel flat and clumpy. Now, for some folks who have a dryer in their homes, that’s not too big an inconvenience. For those who do not, there’s a bit more hassle that goes into finding a laundromat. So, for folks who are looking to get right into the sleep as soon as their pillows arrive, this is something to consider! Clumpy Fill — The polyfoam inside the MyPillow is shredded in order to provide a fluffable, foldable feel. However, because it’s shredded and isn’t as resilient as memory foam or latex, the fill has the potential to clump and divide. It’s fairly easy to push all the fill into one section of the pillow, or for the weight of your head to divide the fill down the middle of the pillow. In my experience, the lower the fill level, the more likely this is to happen. Throw it in the dryer and frequently fluffing the MyPillow is a good way to liven up the fill and keep it from feeling lumpy. Heat Trapping — Polyfoam is not the most breathable material, so it does have the potential to trap heat. In my experience with MyPillow, lying in any one spot on the pillow for too long will cause it to warm up a bit. So, some frequent pillow-flipping was involved! Sleepers who are into the cushiony feel of the MyPillow’s polyfoam might not be quite as compatible with the squishy Hyper-Elastic Polymer™ inside the Purple Pillow. As far as sleep accessories go, these two contenders have pretty different personalities! 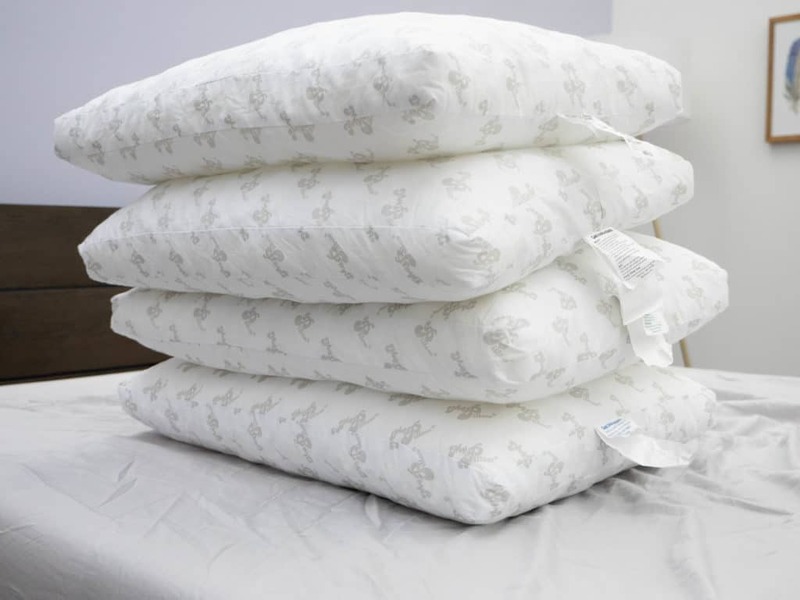 Feel of the Fill — Each of the four MyPillows are filled with fluffy polyfoam which has a foldable, cushy-soft feel to it. The Purple Pillow, on the other hand, is made from the company’s patented Hyper-Elastic Polymer which has a distinctly squishy and bouncy feel. While both brands are designed to accommodate sleepers of all styles, the nature of each pillow’s fill is going to conform to the sleeper’s head and neck in very different ways. Sleeping Cool — As far as temperature goes, neither pillow is particularly cooling. The Purple Pillow offers a temperature-neutral quality using a grid-like interior and breathable cover fabric which enhances airflow. So, it’s not really cooling you down — it’s keeping you comfortable. The polyfoam in MyPillow, in my experience, does have the potential to trap heat a bit. Shape and Resilience — As I mentioned, the polyfoam inside the MyPillow has a cushy feel to it, but it is easily compressed and requires frequent fluffing in order to maintain its shape. The Hyper-Elastic Polymer is super stretchy and resilient to pressure which helps it to maintain its shape over time. While there are more similarities between the Casper and MyPillow than there are with the Purple, these pillows still have markedly different characteristics. Unlike the MyPillow, the Casper offers a cooling, feathery pillow that’s zipped up inside a cushiony gusset. No Foam — Unlike MyPillow, the Casper pillow is not filled with foam of any kind. So, while it does have a fluffy quality about it, the silky low-friction fibers and poly microfiber that make up the Casper offers more of a liquid-like fluff than the couch-cushiony fluff of the MyPillow. Sleeping Cool — Part of the reason Casper chose not to use foam to fill its pillow is because foam is extra sensitive to temperature. Instead, they use a breathable percale weave cotton cover and low-friction fibers to enhance the breathability and cooling features of the pillow. As I mentioned, polyfoam (like in the MyPillow) has a greater likelihood of heating up over the course of your sleep. 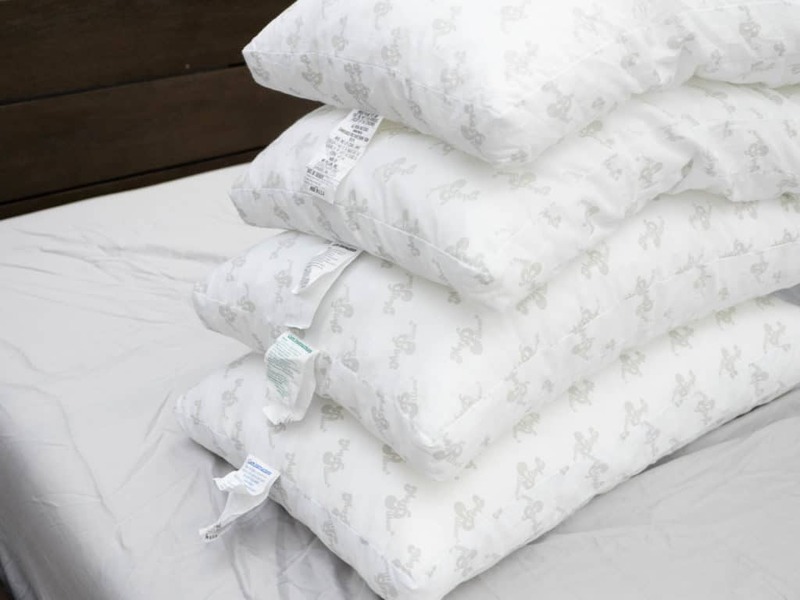 Fill Distribution — The shredded polyfoam that fills the MyPillow does tend to clump and divide without frequent fluffing, but the Casper pillow’s outer gusset is designed to prevent that. The people at Casper refer to it as the pillow’s “backbone”, helping to evenly distribute the fill for a consistent loft throughout. 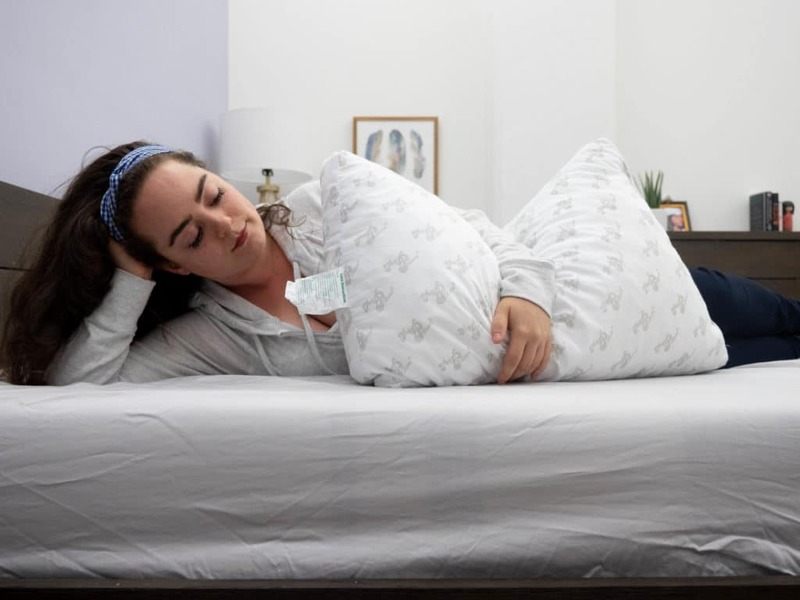 While the MyPillow and the Sleepgram pillows are filled with different materials, they do have some interesting things in common, especially when it comes to combo sleepers. 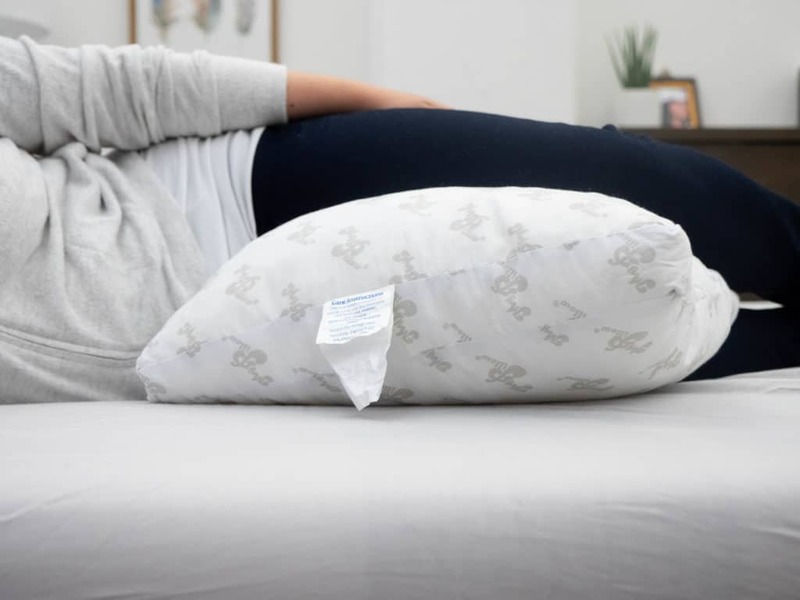 Fill Levels — The four different fills levels of the MyPillow offer varying degrees of support so that folks can pick the one that’s right for them based on their preferred positions. Similarly, the Sleepgram offers three different firmness options according to how you configure the pillows inside of the Sleepgram’s cover. So, combo sleepers might especially benefit from the versatile nature of both of these pillows. Fluffy Fill — The Sleepgram is filled with a down-alternative called poly microfiber, and the MyPillow is filled with polyfoam. While the poly microfiber offers a slower response to pressure, they both have a fluffy, foldable feel. Not to mention, the cover fabrics of both pillows are made from 100% cotton, so they are similar to the touch. Sleep Temp — In my testing of these pillows, I found both to trap a bit of my body’s heat. The cover fabrics are pretty light and airy, but each pillow’s fill has the potential to heat up so, if you’re a hot sleeper, that’s something to consider. Machine washable and dryable — These pillows are super easy to care for! You can wash them on a cold or warm cycle, and dry with as much heat as you like! 60 Day Money-Back Guarantee — If you don’t love your MyPillow, you have 60 days to send it back for a full refund, minus what you paid for shipping and handling. 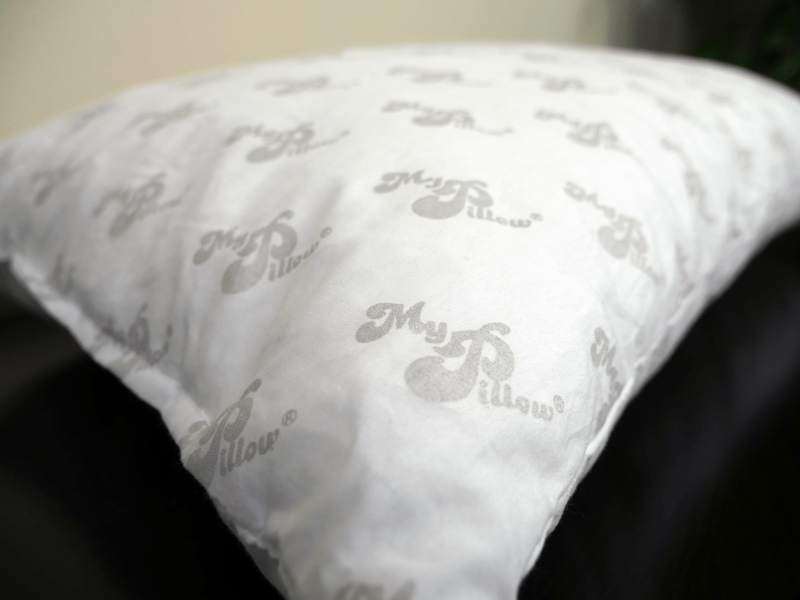 10 Year Limited Warranty — MyPillow will replace any defective product with a pillow of equal or greater value. Giza Elegance — Every MyPillow pillow is filled with the same material, but MyPillow does offer a pillow called Giza Elegance which is covered in extra-long staple cotton and finished with a sateen weave. This pillow also offers four different fill levels, but a “lavender” level replaces the “white” level that we see in the other pillows (the fill power is the same). Also, the fill color is indicated by a corded piping along the pillow rather than the writing on the tag. For example, the lavender fill level would have a lavender cord piped around the side of the pillow. Pricing — Each MyPillow Premium is $79.98 for a Standard/Queen, and $89.98 for a King. MyPillow does offer 4-pack specials and buy-one-get-one specials as well. Head over to MyPillow to buy your new pillow directly! While MyPillow doesn’t offer cooling features or adjustability, the variety of fill levels offered is very valuable (especially for combo sleepers!). Sleepers can mix and match different levels of fill in order to accommodate various positions, and even stack them to play around with the loft and level of support. 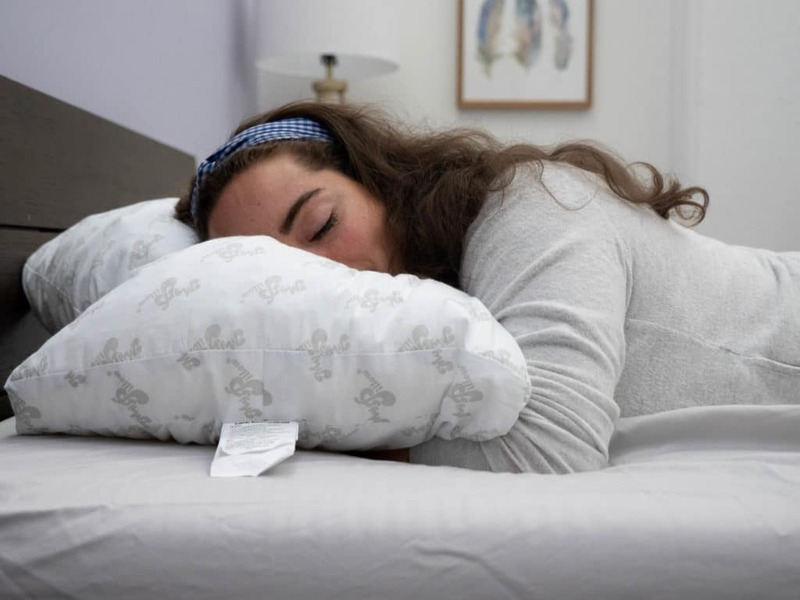 Sleepers who like a fluffable, foldable pillow would likely be most compatible with MyPillow as the polyfoam inside offers a cushy-soft feel. Ultimately, MyPillow has a very traditional cloud-like feel, but the variety of fill levels really sets it apart.